New Széchenyi Current Asset Loan | Hitelpont Zrt. How big a boost would 50,000,000 HUF give your company? 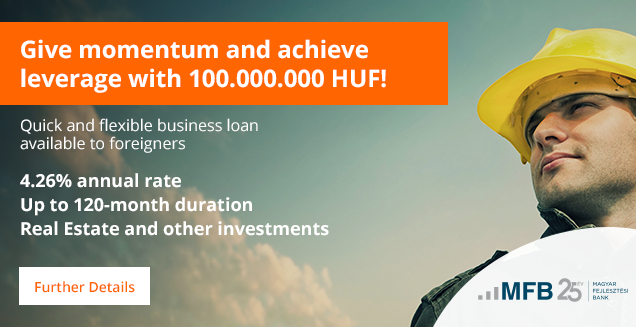 Expand your company with minimal own resources with the New Széchenyi Investment Loan, optimised for small companies and available from Hitelpont Zrt. With real-estate property collateral you can apply for up to 50,000,000 HUF with a 3-year term and maximum 6.5% APR. Can also be used to purchase merchandise, raw materials or consumables. Simple. Convenient and inexpensive access to funds for expanding your company or making investments. Predictable. You repay the same amount each month, without any surprises. Deferrable repayments: up to 30% of the loan can be deferred until the last month of the term as residual value. Flexible. No penalty for early repayment, so if you can repay the loan earlier, you may terminate the contract without any extra costs. Versatile. You can apply at a very early phase, e.g. for a new business or for projects already in progress. Convenient. You can also manage your application online, which allows you to track the entire application process: for example, which (additional) documents you need to submit and when a decision will be made on your application. The New Széchenyi Current Asset Loan may be applied for by resident SMEs, as defined in Regulation (EC) No 800/2008, with a registered seat in Hungary or a registered seat within the European Economic Area and a branch site in Hungary. Applicants must be incorporated or unincorporated business associations, sole traders or cooperatives. You are eligible to apply for this loan if the total employee count of your company is less than 250 and its annual revenue is at most 50 million EUR or its annual balance sheet total is at most 43 million EUR. What loan amount can I apply for? with a maximum term of 36 months. Since every company is unique, this varies. Typically 2-4 weeks pass between receiving the loan application and signing the agreement. Where can I find all necessary information? Click on the “Download detailed prospectus” button below or enquire via any of our contact details, which can be found in the “Contact” menu item. Should you have any questions, please send them to us via the online administration menu at the top of the page and our staff will contact you within 1 day. Download the detailed prospectus from below, together with the documents related to the product. We list the documents required for application in detail in the checklist. Contact us by telephone and set up an appointment for a personal consultation, where we will answer all your questions . You can send us informal documents via e-mail or register on our online application interface and upload them to your personal profile. Bring official documents to the personal consultation. Track the entire application process from pre-qualification to loan assessment on our online interface! Can we help you choose a product? * We will only notify you as new products become available!